Not to be confused with Loews Corporation or Loews Cineplex Entertainment. For other uses, see Lowe's (disambiguation). For the unrelated chain, see Love's Travel Stops and Country Stores. Lowe's Companies, Inc. (/loʊz/), doing business as Lowe's, is an American retail company specializing in home improvement. Headquartered in Mooresville, North Carolina the company operates a chain of retail stores in the United States, Canada. As of February 2019[update], Lowe's and its related businesses operate 2,002 home improvement and hardware stores and employ almost 300,000 people in North America. Lowe's is the second-largest hardware chain in the United States behind The Home Depot and ahead of Menards. Globally, Lowe's is also the second-largest hardware chain, behind The Home Depot but ahead of European retailers Leroy Merlin, B&Q and OBI. The first Lowe's store, Lowe's North Wilkesboro Hardware, was first opened in North Wilkesboro, North Carolina in 1921 by Lucius Smith Lowe (1879–1940). After Lowe died in 1940, the business was inherited by his daughter Ruth, who sold the company to her brother Jim that same year. Jim took on Carl Buchan as a partner in 1943. Buchan anticipated the dramatic increase in construction after World War II, and under his management, the store focused on hardware and building materials. Before then, the product mix had also included notions, dry goods, horse tack, snuff, produce, and groceries. The company bought a second location in Sparta, North Carolina in 1949. Lowe and Buchan differed on expanding the company to new areas and they split in 1952 with Buchan (himself) taking control of the hardware and building supply business and Lowe taking other joint ventures the two controlled (including a car dealership). Buchan became the sole owner of Lowe's. In 1954, Lowe started the Lowes Foods grocery store chain. By 1955, Buchan quickly expanded the company by opening stores in the North Carolina cities of Asheville, Charlotte, and Durham. More stores opened through the 1950s. In 1961, Buchan died of a heart attack at age 44. His five-man executive team, which included Robert Strickland and Leonard Herring, took the company public in 1961. By 1962, Lowe's operated 21 stores and reported annual revenues of $32 million. Lowe's began trading on the New York Stock Exchange in 1979. Lowe's suffered in the 1980s due to market conditions and increasing competition from the new big-box store chain, The Home Depot. For a while, Lowe's resisted adopting the mega-store format partly because its management believed the smaller towns where Lowe's mostly operated would not even support huge stores. However, Lowe's eventually had to adopt the big-box format in order to survive. Today, most Lowe's stores are part of the big-box variety, although some classic format stores remain in smaller markets. Lowe's has since grown nationally, as it was aided by the purchase of the Renton, Washington-based Eagle Hardware & Garden company in 1999. It is now the 2nd largest home improvement store chain in North America and has begun expanding outside the United States. The first store outside of United States was in Hamilton, Ontario, Canada. According to their website, Lowe's has operated/serviced more than 2,355 locations in the United States, Canada, and Mexico alone. On November 5, 2018, Lowe's announced that it will be closing 51 under-performing stores, 20 stores in the United States and 31 in Canada under the Lowe's and Rona names by February 2019. In November 2018, Lowe's announced that it will close all stores in Mexico in the future. For the fiscal year 2018, Lowe's reported earnings of US$3.436 billion, with an annual revenue of US$68.619 billion, an increase of 5.5% over the previous fiscal cycle. Lowe's shares traded at over $96 per share, and its market capitalization was valued at over US$75.8 billion in October 2018. Lowe's ranked No. 40 on the 2018 Fortune 500 list of the largest United States corporations by total revenue. Lowe's#487 in Chapel Hill, North Carolina. A typical Lowe's storefront in Santa Clara, California. In 1998, Lowe's purchased the Wilkes Mall in Wilkesboro, North Carolina, to serve as the company's headquarters. In 2002, Lowe's acquired full control over the 440,000 square foot building after the lease of the 10 remaining mall tenants vacated the property. A year later, Lowe's constructed and relocated the corporate headquarters to a new, 350-acre campus in Mooresville, North Carolina, a suburb of Charlotte. The new facility contains a five-story, and two seven story buildings. The building has a central atrium and two office wings; the atrium houses a food court, a five-story spiral staircase, and meeting and reception rooms. A 7-acre (2.8 ha) lake flows underneath the headquarters building. Lowe's maintained it's former headquarters in Wilkesboro, where it employs over 2,400 people. In 2011, Lowe's invested $10 million in improvements in renovations in the property, including a full service food court, coffee shop, health center, as well as gating the entire property with an addition of a guardhouse. Lowe's Companies Canada is based in Boucherville, Quebec, after the merger with Rona. Prior to 2016, Lowe's Canada was headquartered in Toronto, Ontario. Lowe's operates customer contact centers in Mooresville and Wilkesboro, North Carolina,as well as Indianapolis, Indiana, Albuquerque, New Mexico, and India. Lowe's won eight consecutive Energy Star awards from 2003 to 2010, including four Energy Star Partner of the Year awards for educating consumers about the benefits of energy efficiency. On March 1, 2010, Lowe's also became the first winner of the Energy Star Sustained Excellence Award in Retail, to recognize its contribution to reducing greenhouse gas emissions by promoting energy-efficient products and educating consumers and employees on the value of the Energy Star program. In 2000, Lowe's released a policy promising that all wood products sold would not be sourced from rainforests. However, according to a 2006 report released by the Environmental Investigation Agency, wood used in flooring that Lowe's was selling had been coming from the forests of Indonesia’s remote Papua Province, where some logging was estimated to be illegal. Lowe's purchased naming rights of Charlotte Motor Speedway in Charlotte, North Carolina, in 1998, and the speedway changed names to Lowe's Motor Speedway. After the ten year naming rights expired, Lowe's extended naming rights by one year. After the one-year extension expired, Lowe's discontinued naming rights, and as of the 2010 racing season the racetrack returned to its original name. Lowe's is an associate sponsor of several Speedway Motorsports, Inc. properties such as Atlanta Motor Speedway and Bristol Motor Speedway. The corporation was the primary sponsor for 7-time NASCAR Sprint Cup Series champion Jimmie Johnson in the No. 48 Chevrolet Camaro ZL1 and it was a part-time sponsor of the former No. 5 Nationwide Series car; both teams are owned by Hendrick Motorsports. Prior to the current sponsorship deal with Hendrick Motorsports, Lowe's was the sponsor of the No. 31 Chevrolet for Richard Childress Racing driven by Mike Skinner and Robby Gordon from 1997 to 2001. Prior to the RCR deal, Lowe's was the primary sponsor of the No. 11 Ford driven by Brett Bodine for Junior Johnson & Associates and later his own team, Brett Bodine Racing (after Bodine bought the No. 11 from Johnson). One of the company's earliest forays into racing sponsorship was in 1979, when it sponsored the No. 2 Buick of the Rod Osterlund team in what was then known the Winston Cup Series, for the Talladega 500. The car was driven in that race by David Pearson, subbing for injured rookie Dale Earnhardt. Lowe's would continue with sporadic car sponsorship throughout the next two decades until the aforementioned Bodine sponsorship in 1995. On March 14, 2018 Lowe's announced they would end sponsorship of the No. 48 car after the 2018 season therefore ending all involvement in Motorsports. Lowe's also sponsored Fernandez Racing in the American Le Mans Series and previously sponsored the team in the Rolex Sports Car Series; in that series, Lowe's sponsored the No. 99 Gainsco Stallings Racing Pontiac in events where Johnson was driving. In 2006, Lowe's contracted designer Marianne Cusato to develop and offer affordable house plans for the hurricane-affected Gulf region. Lowe's is the exclusive retailer for both the plans and building materials for the Lowe's Katrina Cottage. They offer easy construction and affordability, as well as the possibility of expansion. Moreover, they meet all international building codes and exceed hurricane codes. Lowe's discontinued the Katrina Cottage line in 2011. Lowe's has a wide variety of television and radio commercials. A significant number of different racing-inspired commercials can be seen and are often played outside of television race coverage. Before 2010, when he was replaced by Ben Yannette, Gene Hackman's voice could be heard on many commercial advertisements for Lowe's. In 2006, Lowe's began sponsoring the radio broadcast booth of the New York Yankees. Frequently during every game Yankees announcer John Sterling stated "We are coming to you live from the Lowe's Broadcast Booth. Lowe's: Let's build something together.". The tag line was changed in September 2011 to 'Never Stop Improving'. They sell the generic brand Kobalt of hand and power tools. The hand tools have a lifetime warranty. 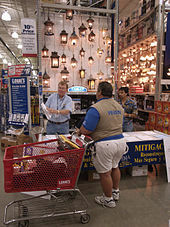 Lowe's withdrew its advertising from the TLC reality television show All-American Muslim in December 2011. A spokesperson for Lowe's said that "we understand the program raised concerns, complaints, or issues from multiple sides of the viewer spectrum, which we found after doing research of news articles and blogs covering the show". Lowe's faced a backlash from several quarters, including Muslim-American and Arab-American organizations. The American-Arab Anti-Discrimination Committee called upon members to contact Lowe's to urge it to reverse its position. The Los Angeles chapter of the Council on American-Islamic Relations met to consider possible actions, including boycotts and protests. Several celebrities also called for a boycott. California State Senator Ted Lieu called Lowe's decision "naked religious bigotry" and said he would consider legislative action if Lowe's did not apologize to Muslim-Americans and reinstate the ads. Abraham Foxman of the Anti-Defamation League expressed similar views. Keith Ellison, the first Muslim elected to the United States Congress, criticized Lowe's decision to "uphold the beliefs of a fringe hate group and not the creed of the First Amendment". Representative John Conyers of Michigan called on Lowe's to apologize. Michigan state representative Rashida Tlaib contacted the company's corporate headquarters, reporting that Lowe's declined to change its decision. Based in Toronto, Ontario, Lowe's opened its first three stores in Canada on December 10, 2007, in Hamilton, Brampton and Brantford. On February 1, 2008, they opened three more stores in Toronto, East Gwillimbury, and a second store in Brampton as well as a new location in Maple (Vaughan). Currently, additional stores are under construction, with 19 now open in the province of Ontario. Lowe's also expanded into western Canada, starting with three new stores in Calgary, Alberta. One of the three locations opened in late September 2010. The other two opened in early 2011. There are now stores in British Columbia, Manitoba and Saskatchewan. To date (2018) Lowe's has 62 locations in Canada. Each store represents an average investment of $20.5 million ($20.4 million USD). In February 2013, former Walmart Canada and Loblaw Companies executive Sylvain Prud'homme was hired as CEO of Lowe's Canada. On May 11, 2015, Lowe's Canada announced that it would acquire the leases of 13 former Target Canada stores, as well as an Ontario distribution centre, for $151 million. In 2012, Lowe's attempted to buy Rona, Inc., a Quebec-based hardware chain. However, the deal was met with objections from Rona shareholders (particularly the Caisse de dépôt et placement du Québec) and operators of its franchised locations over concerns that the company could centralize its supply operations in the United States, and was eventually called off. On February 3, 2016, Rona announced that it had accepted an offer to be acquired by Lowe's for CDN$3.2 billion, pending regulatory and shareholder approval. The division will remain under the leadership of Sylvain Prud'homme, but will be operated out of Rona's headquarters in Boucherville. Lowe's plans to maintain Rona's retail banners, "key" executives, and the "vast majority of its current employees" post-acquisition. As of 2016, Lowe's Canada and Rona together have 539 store locations. Trading as Masters Home Improvement, the first store opened in Braybrook, Victoria to tradesmen on August 31, 2011 and the general public on Masters was a joint venture of the Lowe's Companies, Inc., and Woolworths Limited to compete against the Wesfarmers-owned Bunnings Warehouse, which operates in the large bigbox format similar to Lowe's and Home Depot. The stores will be 1/3 owned by Lowe's Companies Inc. (USA) and 2/3 owned by Woolworths Limited (Australian Owned Public Company Listed on the Australian Securities Exchange (ASX)). On 18 January 2016 Woolworths announced that it intended to "either sell or wind up" all its home improvement area, including the Masters hardware chain. Chairman Gordon Cairns said that it would take years to become profitable and that the ongoing losses could not be sustained. The windup will involve Woolworths buying back a 33.3 per cent interest in the venture, held by the Lowe's subsidiary WDR Delaware Corporation. As of 28 August 2016 all stores are due to cease trading on, or before, 11 December 2016. Lowe's was involved in a small cluster of class action lawsuits that revolved around the Lowe's employee payment system. The cases focused on a pay practice known as "variable rate overtime". Variable rate overtime has the effect of paying a decreasing overtime rate the more hours a person works in a week. The suits alleged that salaried managers who worked 40 to 50 hours per week were improperly compensated for that time. The variable rate overtime ended in the first quarter of 2006. The first case was filed in October 2002 by employees of the Lowe's store in Shawnee, Kansas. In September 2005, the cases were certified as class action. Lowe's has four similar cases in New York, Indiana, Pennsylvania, and Ohio. The lawsuits for New York, Indiana, and Kansas resulted in an out-of-court settlement on September 22, 2006. The lawsuit in Pennsylvania became a class-action lawsuit in June 2004, with 550 employees. The case in Ohio was filed by ten former Lowe's employees, in August 2004. Lowe's faced multiple lawsuits from its Loss Prevention Managers citing that they were classified as exempt employees and therefore denied overtime pay. The managers asserted that they were forced to work a minimum of 48 hours per week which saved Lowe's and its investors millions of dollars every year. Lawsuits have been settled for $2.95 million in California and $6.2 million in Texas. In 2014, Lowe's faced a class action lawsuit from former and current Human Resource Managers. Similarly to the lawsuit regarding its Loss Prevention Managers, the lawsuit stated that the HR Managers were improperly and illegally classified as exempt employees and were therefore denied overtime even though they were required to work 48-hour weeks. ^ a b "News Release Archive - Site Password". mediaroom.com. Retrieved 4 December 2014. ^ a b Cite error: The named reference Financials_2019 was invoked but never defined (see the help page). ^ a b c d e f "2018 Annual Financials Form 10-K". April 2, 2018. Retrieved August 15, 2018. ^ "Lowe's". Fortune. Retrieved 2016-08-07. ^ "Lowe's targets Canada, No. 2 U.S. home retailer plans 69 store openings to tap into expanding, $39 billion market". Toronto Star. Sep 20, 2007. ^ "Caleb Anson Lowe (1820 - 1902) - Find A Grave Memorial". findagrave.com. Retrieved 4 December 2014. ^ "Lucius Smith Lowe (1879–1940) - Find A Grave Memorial". findagrave.com. Retrieved 4 December 2014. ^ "John Anton Lowe (1850 - 1914) - Find A Grave Memorial". findagrave.com. Retrieved 4 December 2014. ^ a b Williams, Shane. "Lowe's Companies". North Carolina History Project. ^ Upbin, Bruce (20 January 2003). "Work and Buy and Hold". Forbes. ^ "Carolinas FYI: About Lowe's and Lowes," The Charlotte Observer, March 16, 2003. ^ "Company News; Lowe's to Acquire Eagle Hardware and Garden". New York Times. 1998. ^ Valinsky, Jordan (2018-11-05). "Lowe's is closing 51 stores in the US and Canada". CNN. Retrieved 2018-11-06. ^ "Lowe's Revenue 2006-2018 | LOW". www.macrotrends.net. Retrieved 2018-10-30. ^ "Lowe's adding 200 jobs in Wilkesboro". Wilkes Journal-Patriot. 2017-11-17. Retrieved 2018-06-17. ^ "LOWE'S REVEALS WESTERN CANADA EXPANSION PLANS." Lowe's. December 7, 2009. Retrieved on February 1, 2011. ^ "Lowe's Becomes First Retailer to Win Energy Star Award for Sustained Excellence in Retail". businesswire.com. 2010-03-01. Retrieved 2010-03-14. ^ "Lowe's Launches Forest Protection Initiative". socialfunds.com. 2000-08-11. Retrieved 2008-05-06. ^ Butler, Rhett A. (2006-03-23). "Home Depot, Lowe's selling illegal wood from Papua New Guinea-Report". mongabay.com. Retrieved 2008-05-06. ^ "Lowe's negotiating naming rights with speedway". WBTV. Retrieved 2018-01-19. ^ Elliott, Stuart (28 February 2010). "Lowe's Puts Its Focus on Knowing the Customer's Wants". The New York Times. Retrieved 13 December 2011. ^ a b Sacirbey, Omar (December 9, 2011). "Companies pull ads from Muslim reality TV show". Huffington Post. ^ a b c "Lowe's faces backlash over pulling ads from 'All-American Muslim'". Los Angeles Times. Retrieved 4 December 2014. ^ "ADL, Reform group rip Lowe’s for pulling ads from show on Muslims." Jewish Journal. 15 December 2011. 16 December 2011. ^ a b "Lowe's taps ex-Loblaws exec Sylvain Prud'homme to head Canadian unit". Financial Post. Retrieved 3 February 2016. ^ Carville, Olivia (11 May 2015). "Lowe's to buy 13 Target stores". Toronto Star. ^ "Lowe's offers $3.2B to take over Canadian rival Rona". CBC News. Retrieved 3 February 2016. ^ "Scranton news, sports, obituaries, and shopping - thetimes-tribune.com - The Times-Tribune". thetimes-tribune.com. Retrieved 4 December 2014. ^ "Pennsylvania Accident Attorney Todd J. O'Malley : Scranton Lawyer" (PDF). O'Malley & Langan Law Offices. Retrieved 4 December 2014. ^ "Lowe's Hammers Out $6.2M Deal In Managers' OT Case". law360.com. Retrieved 4 December 2014. ^ "Lowe's HR Manager Overtime Wage Claim Website - Feldman Morgado, PA". loweshrmanagerflsaclaim.com. Retrieved 4 December 2014. 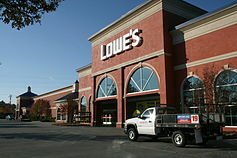 Wikimedia Commons has media related to Lowe's.